How do I get a ribbon? For all operation-related ribbons, members can nominate others by posting in the Ribbon Nominations thread. So, if after an op you think your section leader managed to get through the entire mission without a single KIA, you can nominate them for the 'leadership ribbon'. For all community-related ribbons (e.g. donator ribbon), these will be normally be assigned by Officers. 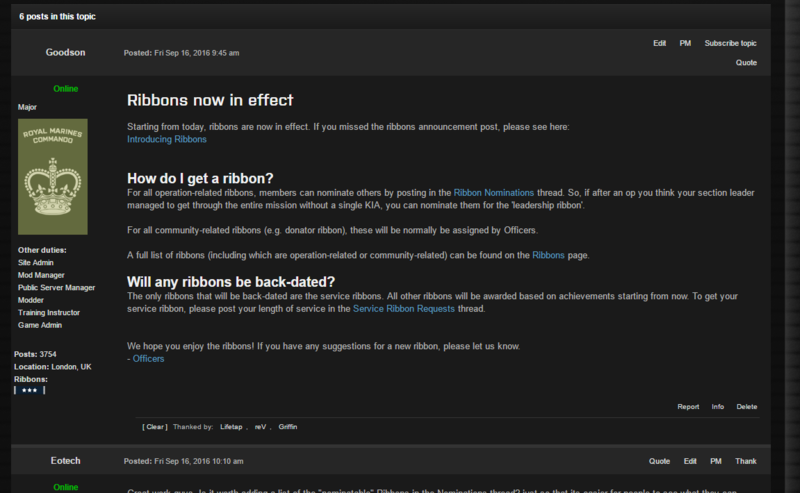 A full list of ribbons (including which are operation-related or community-related) can be found on the Ribbons﻿ page. Will any ribbons be back-dated? The only ribbons that will be back-dated are the service ribbons. 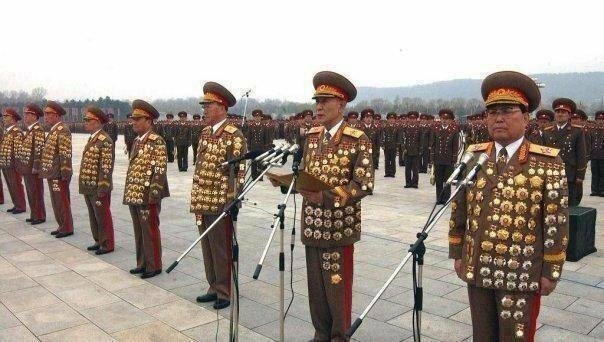 All other ribbons will be awarded based on achievements starting from now. To get your service ribbon, please post your length of service in the Service Ribbon Requests thread. We hope you enjoy the ribbons! If you have any suggestions for a new ribbon, please let us know. Great work guys. Is it worth adding a list of the "nominatable" Ribbons in the Nominations thread? just so that its easier for people to see what they can nominate people for. As mentioned in the post, members can be nominated for all operation-related ribbons. Community-related ribbons are assigned by Officers (i.e. not 'nominatable'). Is there a user config option to not display ribbons in the forums, so that we don't have to scroll for miles to read posts? Ideally it would be nice to have the option of switching off the shoulder tag image and Other Duties too. For example, Goodson's posts now take up more than half of my screen for a single line post and I presume this will only increase as ribbons are awarded. However, the user control panel option is a nice idea. We will remember them good times. I don't think there is that many people left who would get such a Ribbon Cat.